Korean mobile giant LG decided to wrap its MWC lineup early in their own backyard. 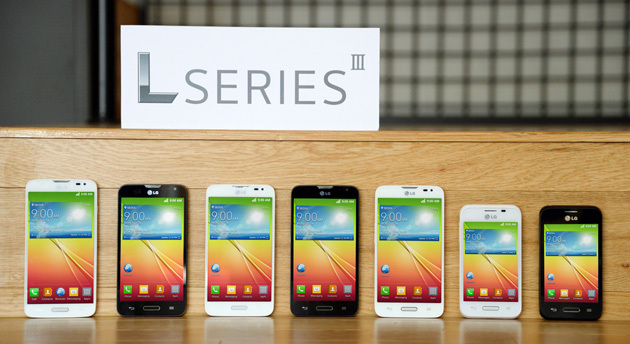 They announced the L Series III trio of entry-level and mid-range 3G smartphones. All these devices L90, L70, and L40 will be showcased during MWC in Barcelona. Two very good news are all 3 devices have Android 4.4 KitKat out of the box with removable battery. LG L40 will be the most affordable member of the trio. Its specs include 1.2GHz dual-core CPU, 3.5” display with resolution of 480 x 320 pixels, 4GB of built-in memory, and 512MB of RAM. Depending on the market it is offered, the LG L40 will feature 1,700mAh or 1,540mAh removable battery. Its measures are 109.4 x 59.0 x 11.9mm. Next in the line is the LG L70. It packs a 1.2GHz dual-core CPU and 4.5” WVGA (800 x 400 pixels) IPS display. The rest of the L70’s revealed specs include 1GB of RAM, 4GB of built-in memory, and 8MP or 5MP main camera depending on the market the handset is sold. It measures of the LG L70 are 127.2 x 66.8 x 9.5mm. It packs a 2,100mAh removable battery. Among these three the LG L90 is the top of the line. The handset features 1.2GHz quad-core CPU, a gig of RAM, and 8GB of built-in memory. The rest of the spec sheet’s highlights include 4.7” qHD (960 x 540 pixels) IPS display, 8MP main camera, and 1.3MP front-facing unit. It measures of the L90 are 131.6 x 66.0 x 9.7mm. It is powered by a 2,540mAh battery. There is no word on release or price yet. But we hope that our wait will not be long for that.